This is a snap activity that the students can do in groups. They have to match the picture with the right sentence. (You have to cut the cards first). 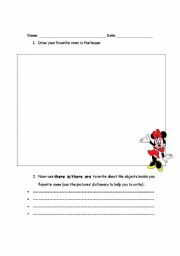 Your student can use this worksheet to write a short paragraph about themselves. There are some guiding questions to help them brainstorming. They will have to use present tense. Use this worksheet to help your students practice using have to/ has to by filling the gap with right answer. You can use it also to help them review daily routines. 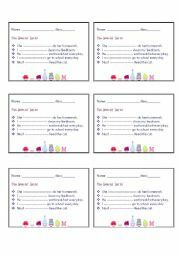 This worksheet can be used after a speaking activity at the beginning of the school year where you want your students to get to know each other. Here, the student will start by answering some question as a brainstorming activity. Then, they will start to write a short paragraph about one of their friends by using the present simple tense. 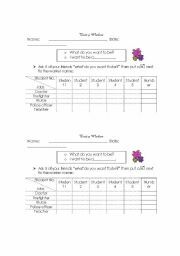 This worksheet can be used to have students interviewing each other to practice using frequency adverbs. The worksheet is divided into two sections for student 1 and student 2. 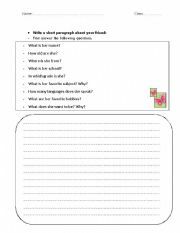 This is a simple writing worksheet. 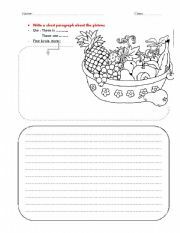 You can use it to have the students d3scrbing a picture by using there is and there are to write about fruits in a basket. This is a worksheet that can be done as a project. 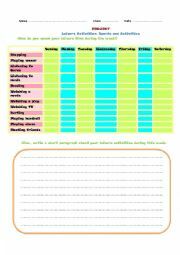 The students have to fill in the table with their leisure activities during a week. The teacher will have to check the students work in a daily basis during this week. Then, the students will have to write a paragraph about their week. 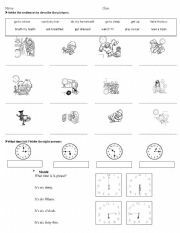 This is a simple worksheet that would help students to identify daily routines and to practice telling time. You can use this worksheet to have the students using it to practice asking and answering questions about their future jobs. The students can later share tier findings. Actually, this is a worksheet in a form of PowerPoint. Print it and distribute it to your young learners. Ask them to observe the weather during the week and to submit their observation when they are done.